Well what a gorgeous day it was today with fine spring weather and glorious sunshine. I knew that today was a day that my butterfly count was going to increase for sure, but first I had to empty out the moth trap. Lots of Orthosia cruda, O cerasi and O gothica were to be recorded with a couple of Panolis flammea as well. 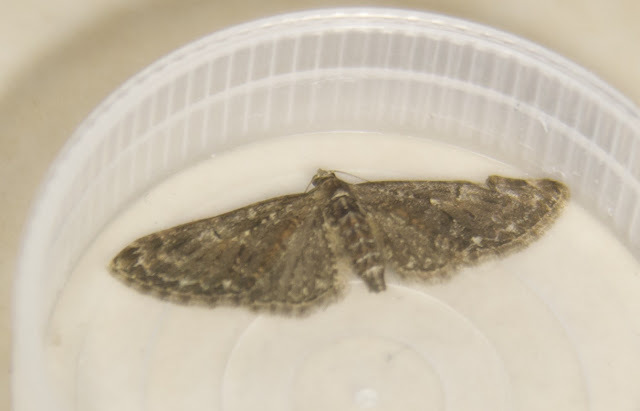 There were also three new species to be recorded, Vespula vulgaris the Common Wasp, Eupithecia abbreviata a Brindled Pug, which I might add was incredibly hard to ID and thanks again to Les Hill for the help, and the last one was Diurnea fagella which has no common name. Well, as I said earlier, I just knew it was going to be a great day for butterflies, so me and the wifey headed off to our local park, Holywells park in Ipswich. We wasn't there long before the first butterfly of the day flitted past, a Brimstone G rhamni. This was a first for me and I can say this butterfly looked awesome in its flittingness, it didn't stop to rest and was soon gone out of sight, so alas, no photos, sorry. 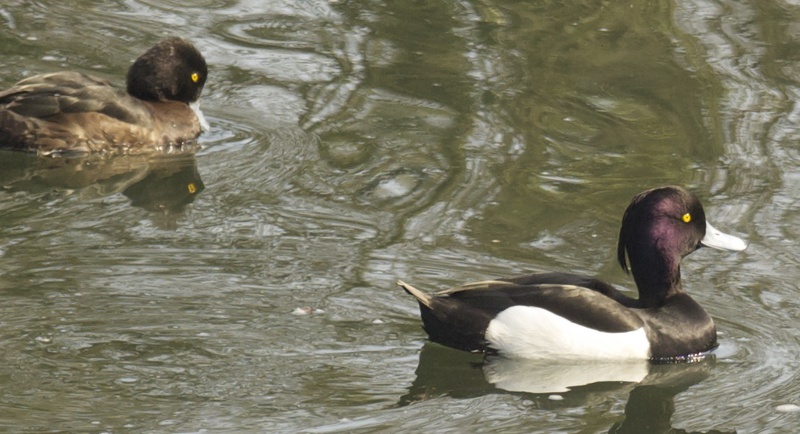 I noticed in the week that my friend Matt Berry of Ipswich Park Rangers had posted some photos of Tufted ducks on the old Facebook, so we headed off to have a look around the pond. It wasn't long before we spotted a pair sitting quietly on the water whilst Coots chased each other round and round. Tufted duck A fuligula. Male in the foreground, or should that be forewater? Whilst watching these ducks and hoping they would come a little closer for a better shot, I looked down to see a cluster of bright metallic green beetles enjoying the midday sun. Unfortunately, due to the fence around the pond, I was unable to get a proper shot of these beetles known as Green Dock Beetles G viridula. Which is a shame as there elytra was quite iridescent and looked fantastic in the sun. Then wifey noticed a small cluster of 7-spot Ladybirds C 7-punctata with a spider sitting on top of them. By the time I got around to trying to get a shot (bloody fence) it had moved and was sitting on a leaf. 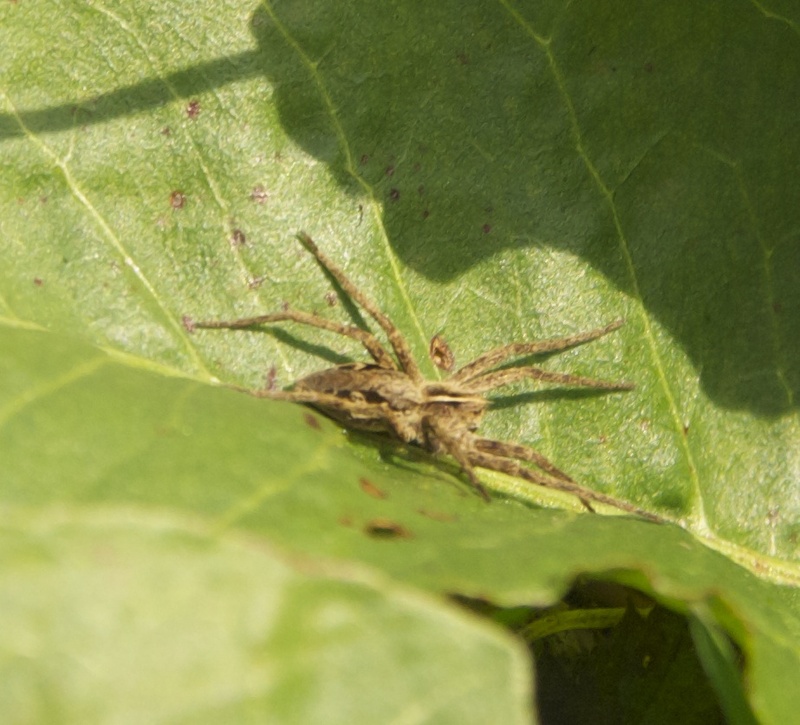 It turns out that it was a Nursery Web Spider P mirabilis. I've found out by the wonderful power of the web that this lovely little spider actually carries its egg beneath her in a ball and when the time is right, she will attach the eggs somewhere safe and spin a web over them and then will sit back and guard them. Now don't panic, usual rules apply here and I will post the picture at the end of the blog so you can continue to read on without fear, I will post a warning before the pic, promise. We still wanted to see more and off we wandered to the western side of the park and this is where we came across one of my wife's favourite little birds, the Robin E rubecula. 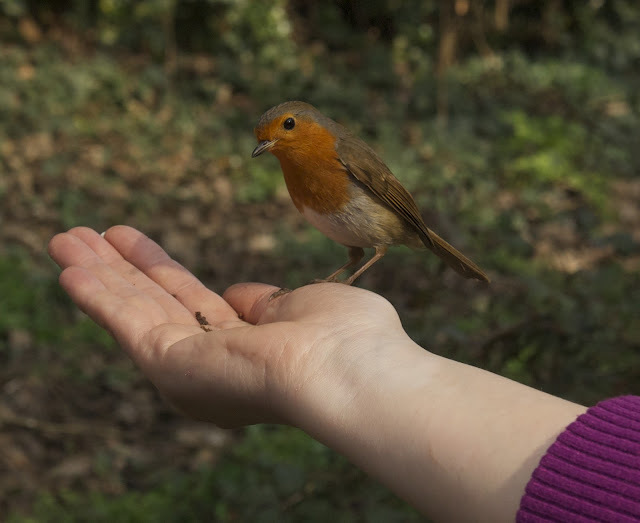 Now, again, Matt had posted up some pictures of this little bird before from quite close up, sitting on his hand in fact. 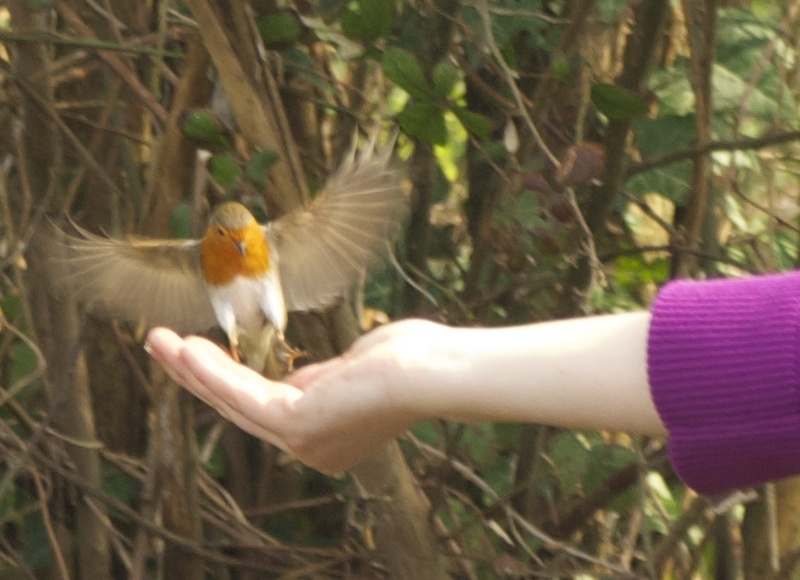 So I told the wifey to put her hand out and it wasn't long before the cheeky little chap was perching on her hand to see what she had to offer. 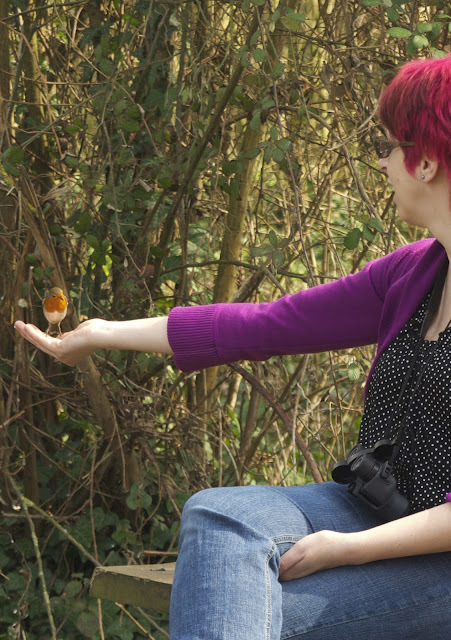 After our little jaunt, I decided for a reccy around Purdis Heath SSSI for some more butterflies, whilst the wifey, quite happy for her little meeting with the Robin, went home. 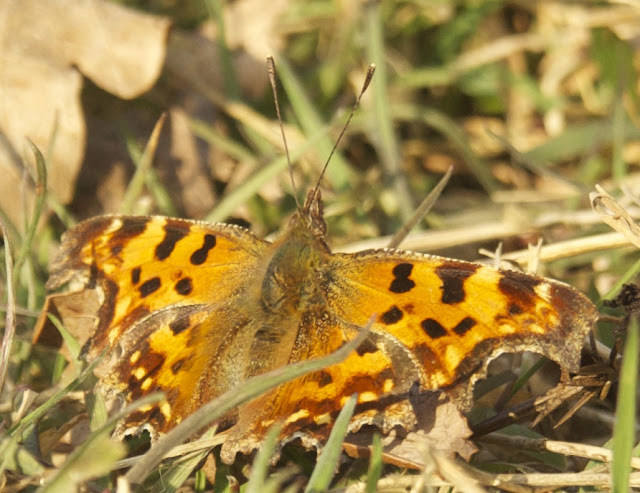 As soon as I got onto the heath I came across a Comma chasing off a Small Tortoiseshell. They seem very aggressive when it comes to territory and I was completely surprised by its amazing vision. It was taking off to see off an intruder even when it was a long way away, to great a distance it would seem, for such a small insect. Comma P c-album on guard duty. 2 x 7-spots, 2 x Pine and the one in the middle which I'm not sure of. As soon as I got home, I started a more detailed search and came up with the ID of a 13-spot ladybird Hippodamia 13-punctata. 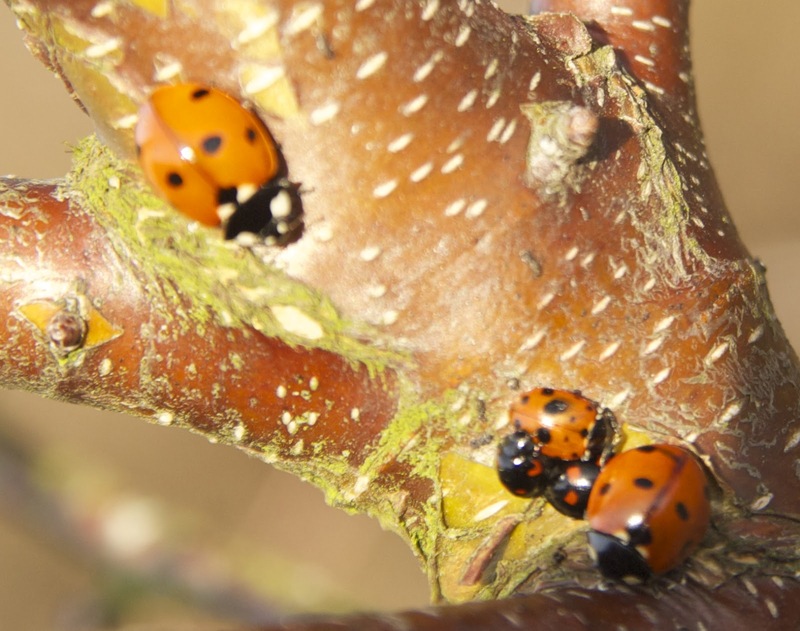 However, this ladybird according to the FSC is extinct! A new find perhaps??? I can see the newspaper headlines now SUFFOLK NATURALIST FINDS EXTINCT BUG!!! I can see more awards people and press flocking outside my door just wanting to speak to the person who brought a species back from the dead. However, I had to be sure, so I uploaded the picture to a website previously mentioned before on here iSpot. I've just this minute checked the results and can confirm I WAS WRONG! It is in fact an Adonis Ladybird H variegeta. But still, a rare find so I'm told. Walking around, despite all the sun and blooming, if not spikey, gorse bushes, I still wasn't seeing a lot of butterfly activity. So I headed off the beaten track and it wasn't long before in the corner of my eye I saw a dark, what I thought was a leaf, on some light coloured and dead bracken. I didn't need to look twice as I knew it to be a Peacock butterfly Inachis io. I took off my aussie hat (good against harsh sun on head) and creeped up very slowy snapping away as I did. As I got close, the butterfly noticed me and started to flash his wings, which if you're a potential predator, can look like a pair of large eyes appearing out of nowhere. This bracken off the beaten track seemed quite popular with the butterflies as they could bask in the sun quietly without someone's errant dog charging through disturbing them every 5 minutes. 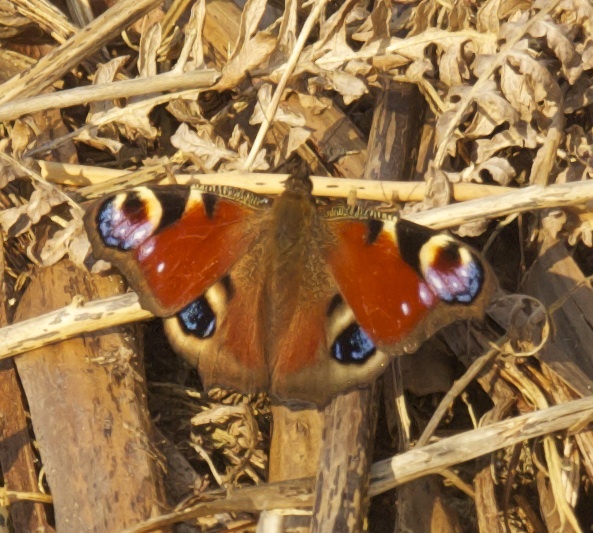 The Peacock is known to spend the winter hibernating in garden sheds and garages and if disturbed can make a squeaky sound as it flashes it wings, to deter predators. They have also recently found out that this squeak made by the wings opening and closing, also resonates at an ultrasonic level which is a deterrent used against bats! And so I wandered on all the time keeping an eye out for a beetle which I've never heard of before until this year that is. It's the Oil Beetle Meloe sp. A rather largish beetle that I heard Nick Baker (man off the telly) refer to as the HGV trucks of the beetle world. They're quite a size, flightless and have quite a complicated life cycle and very strangely, absent from the east of England. There used to be 8 different species of Oil beetle, but now there are only 4. I want to find one before they disappear too and I would prefer to find it in East Anglia. They like to lay their eggs (usually thousands) in areas frequented by Solitary bees. The minute larvae hatch and are called triungulins and they have small grapling hook like toes. They climb up to the nearest flower head and then lay in wait for the bee to come along, as soon as it lands they grip onto the bee with their toes and hitch a lift to the nest of the bee where they then feed on the bee eggs, larvae and food stores until they emerge as an adult Oil beetle. More can be found out about this wonderful little creature here. Just one more creature to add and that was found on a cold pond in the back garden this morning, a Common Pond Skater Gerris lacustris and this brings the list too 132 species leaving me only a 123 species behind where I should be. As I've got no work tomorrow, I'm considering getting the moth trap out again tonight in the hope it'll bring me something new. Don't forget, after the list is the picture of the spider I mentioned earlier. ARACHNAPHOBE ALERT!!! LOOK AWAY NOW!!!!! Nursery Web Spider P mirabilis.